An upright oval tree with good branching structure and uniform canopy. A fast grower, with a good mature size. The glossy dark green foliage turns yellow to orange red in the fall. It is adaptable to many different sites. 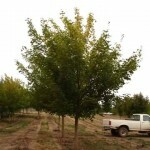 The Acer truncatum parent gives this hybrid summer heat and drought tolerance. Introduced by J. Frank Schmidt & Son.